In recent years, investors have learned the hard truth that in the international economy, politics often matters at least as much as economic fundamentals for the performance of global markets. Too many companies and investors haven't yet learned to read the warning signs: their expertise lies much more in economics than politics, and the temptation is to hope that highly volatile situations such as the 2008 Georgia-Russia confrontation will be few and far between. But as Ian Bremmer and Preston Keat demonstrate, these scenarios--and their catastrophic effects on business--happen much more frequently than we imagine. On the curve that charts both the frequency of these events and the power of their impact, the 'tail' of extreme political instability is not reassuringly thin but dangerously fat. This groundbreaking book is the first to both identify the wide range of political risks that global firms face and show investors how to effectively manage them. Written by two of the world's leading figures in political risk management, it reveals that while the world remains exceedingly risky for businesses, it is by no means incomprehensible. Political risk is unpredictable, but it is easier to analyze and manage than most people think. Applying the lessons of world history, Bremmer and Keat survey a vast range of contemporary risky situations, from stable markets like the United States or Japan, where politically driven regulation can still dramatically effect business, to more precarious places like Iran, China, Russia, Turkey, Mexico, and Nigeria, where private property is less secure and energy politics sparks constant volatility. The book sheds light on a wide array of political risks--risks that stem from great power rivalries, terrorist groups, government takeover of private property, weak leaders and internal strife, and even the "black swans" that defy prediction. But more importantly, the authors provide a wealth of unique methods, tools, and concepts to help corporations, money managers, and policy makers understand political risk, showing when and how political risk analysis works--and when it does not. Authored by Ian Bremmer (author of the bestselling The J-Curve) and Preston Keat, the president and research director (respectively) of Eurasia Group, the world's leading political risk consultancy firm, The Fat Tail is an indispensable guide for anyone involved in the international economy. Solid material, but horribly choppy at times. I have mixed feelings about The Fat Tail. Some chapters unfolded well and were good to read, along the lines of The Black Swan (which The Fat Tail cites and compares itself to in promotional material) and other top quality nonfiction. Other chapters were jumbles of facts, with paragraphs that seemed to not have a point nor to contribute to other ideas presented. I have a suspicion that The Fat Tail was derived from a more polished book or was in progress when the bottom fell out of the market in 2008, and that the book was hastily reorganized with some filler chapters added and then quickly released. The vast majority of business books view extraordinary events as confined to market excursions, peaks and dips. That is, behavior that is generally charted, graphed and nominally legal. This book focuses on how to take measures against non-linear events both at home and abroad. These include terrorism, nationalization, radical taxation, and other types of issues that in the past were viewed as "too uncommon to worry about." In other words, many of those fearsome issues covered (or NOT covered) by "force majeur" clauses in your company and personal insurance policies. The authors do a good job of outlining a framework in which business planners can view the big risks in their businesses and take measures to avoid, mitigate and recover from any issues that may arise. In the last couple of decades the international business scene has been subjected to more risks in the form of criminals, terrorists and bad governments than ever before. Whether one considers exceptional acts of violence such as 9/11 or bald faced government takeovers such as the nationalization of Venezuela's oil infrastructure, a lot of money and often the lives of your team are in jeopardy. Yet so many of us look at the melange with a hopeless resignation and tell ourselves there are other more immediate threats to consider in the regular course of doing business. A regular excuse is that only large multinational companies have the resources to create planning departments large enough to consider planning against these "out-lyer" events. 1. The occurrence of extraordinary business interference is much more common and touches many more of us than we think. 2. Any size business can apply some straightforward principles and monitoring to be in a much better position than they are today. To address the first thought, the authors discuss numerous cases where governments and businesses missed large impact events due to a lackadaisical approach. 9/11 is discussed but so are the nationalizations of oil properties in Venezuela, as well as Mexico and Iran. The reader is encouraged to look at both the very macro view of the world and zoom back down to the local circumstances surrounding the business of interest. That is, it's not enough to look at the national government of a country you wish to do business in. You must also take a look at the conditions in the country side, how the people fare, the existence of a strong political opposition and the form it takes. The position taken is that if one has a large enough business to care what happens in a particular region of the world, you have the resources to visit there, get out of the conference room and look for the general condition. That is, a little work needs to be done. The authors also discuss more sophisticated means of gathering intelligence. On the second point, the book details some review processes that can be helpful in determining ongoing volatility and what kinds of relationships need to be continued or built, the political climate, etc. Some of this was a bit vague in structure for my liking, as it would be helpful to have a template to work from. That is, my company is relatively small, but we do a lot of international high-tech business. A checklist of review items to help come up with a figure of merit or a trend for a region would be great. That said, it was still interesting to consider the angles presented by the authors. Don't read this book if you're looking for stock tips or advice on trading foreign currencies. Investing, as used in The Fat Tail, means committing financial, physical, and human assets to generate return. The authors maintain their broad definition of investing throughout the book. They do not focus on any particular asset classes nor do they provide any tactical guidance. Having said that, Bremmer and Keat have written a book that could easily serve as a text in an MBA-level strategy course. The authors provide a solid theoretical foundation for recognizing and assessing political risks, especially those that should be taken into account when formulating business strategies. Key topics include geopolitics, regulatory risk, domestic instability, expropriation, and terrorism. By no means is The Fat Tail a book meant to be read casually. While the authors write clearly and concisely, avoiding academic jargon for the most part, both the subject matter and presentation are aimed at people who view the world through frameworks and models. Anybody reading this book must be interested in synthesizing political, economic, and financial theory; otherwise it will be a hard, dull slog. * Very few real-world examples are discussed. The scenarios that are included are only briefly analyzed from a lofty perspective. * The book is not very useful on its own for practitioners of strategy. Turning the contents of the book into concrete plans and actions will require additional resources, training, and experience. * Despite the title, there is very little discussion of probability and statistics. Bottom line: Four stars, with the caveat that The Fat Tail is a book targeted to people with an academic or professional interest in corporate strategy. Also, the book is somewhat brief and would benefit from the inclusion of a greater number of case studies and real-world applications. Here we have a title that shamelessly spins off of the popular (and brilliant) popular economic theory "The Long Tail." Consequently, I was skeptical from the start. However, these writers are convincingly authoritative about how political situations affect international business. They argue quite persuasively that investment experts and individuals making investments tend to pay attention to numbers or to product roll-outs or to nuggets of information from business news while neglecting hugely important (uh, "fat") political realities. This book will already have been dated by the time it is printed. Any one making important international business decisions will be wise to read that country's newspaper daily and to read 'Foreign Affairs' magazine which can basically foretell the future. Political Risk Is Bad, Mmmmkay? Predicting risk has always been a challenge for business. It is a probabilistic exercise and one which necessarily relies on the ability to predict the future. These are invariably weaknesses for companies as well as individuals---how many of you predicted at the start of this NFL season that the woeful Arizona Cardinals would appear in the Super Bowl and come within one interception of winning it? To assess risk, one must be able to predict the likelihood of a negative event occurring and set some cost on its occurrence. Folly! These events tend to be examples of what we quality geeks call "special cause variation"---rare and ugly events which simply cannot be predicted outside of geologic time. "The Fat Tail" studies these events. The name comes from the tendency most of us have to simply ignore rare events, even when they're catastrophic. How many of us sweat an asteroid strike like that which wiped out the dinosaurs? We tend to write such things off and go about our lives. So too does business. I was supplier quality manager for a global manufacturing company when an errant U.S. bomb struck a Chinese embassy. We did quite a lot of business in China. Suddenly, every one of our Chinese suppliers refused to ship and gave the same explanation: "We'll start shipping when you stop bombing our embassies." It taught me a valuable lesson about political risk and fat-tailed events---they happen more often than you think they should and they're a bloody headache when they do happen. "The Fat Tail" abounds with these types of examples. What to do about it, though? It is hear that the book falls down. There are several general strategies for mitigating such risk, but the authors seem to believe that more time and attention should be spent attempting to categorize it. I disagree, having spent many hours in failed attempts to do just this. The only effective approach to risk mitigation is to improve your early warning capability so as to identify earlier when a fat-tailed event has occurred, improve your ability to respond quickly to it, and build enough redundancy in that when it does occur it doesn't kill your business. Case in point---the plane that went down in the Hudson. Canadian geese taking out both engines on an airliner is a fat-tailed event. The vast majority of pilots will have no such occurrence in a career of flying. When it did happen, the pilot and crew of this aircraft had the training to respond swiftly. US Airways had enough aircraft, crews, and support services to make sure that the sudden loss of an aircraft to the icy waters didn't kill their operations. First of all, it is not at all clear to me what audience this book was written for. 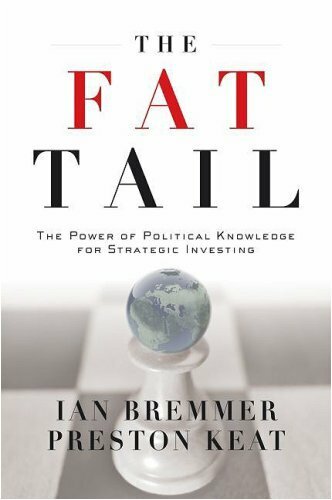 While the book's subtitle is "The Power of Political Knowledge for Strategic Investing." there is little or nothing that individual investors can garner from this book to guide their investing. For the most part, this book states general principles that can be employed to analyze the political risks of a given business's investments and strategic position. This requires specific details of a company's risk exposure which clearly are available only to company executives. While there are some thought provoking ideas I found "The Fat Tail" neither well written nor convincing in the sense of forming a coherent guide to political risk assessment. It seems to have been written partially as an academic advertising piece to promote the authors as political risk consultants. While the chapter on terrorism should be of some general interest, even here there are few useful takeaways that can guide governments much less businesses or individual investors. The authors quote the 9-11 Commission's remark about the intelligence community's "failure of imagination" in regard to the attacks without adequately exploring the inherent unpredicability of acts by a secret cadre of committed conspirators who are willing to die for their cause. While claiming that political risk is "easier to analyze and manage than most people think" the authors fail to make their case in any convincing fashion. Consider the case of the fall of the Iranian Shah in 1978 which is discussed but with the conclusion that "one-off events like revolutions or civil wars are virtually impossible to predict" so it is only possible to discover "which countries are unusually vulnerable." I would have prefered a more detailed and coherent analysis of a few scenarios to give a better appreciation of how historical and social conditions bring forth charismatic leaders such as Ghandi, Lenin or Hitler to lead dramatic social changes and revolutions. Instead the authors cover too much ground without plowing deeply enough in any of it. This book tries to de-risk investing in counties by explaining the influences of politics and to some extent social movements. The book itself has many examples which are fun to read, but it fails utterly in giving a good set of concrete tools. Part of the message is there, but it is hidden deep in all the examples and anecdotes. The literary style of the book is very similar to how some professors teach a class. Provide a list of bullet points, and give several examples of each bullet point. But after reading through it, and explaining all the different potential risks, the book finishes with the following statement: "Balancing this combination of skills is, at the end of the day, more an art then a science." When a book finishes with such a sentence, it does not "show investors how to effectively manage political risk," as is mentioned on the summary page. That said, it is still an interesting read for those with international political and economical inclines. This book makes some solid points showing how most interested parties (governments, companies, investors) largely ignore political risks (risks of foreign incursion, domestic instability, terrorism, expropriation, or regulation) because they are often very difficult to quantify and/or the risks are supposed to be minor (a thin tail on a statistical distribution). The book makes a good case that these risks are not negligible (i.e. they are a fat tail), and proceeds to discuss ways (albeit mostly qualitative) to gage them. Much of the book is depressing (albeit realistic) as it shows numerous examples demonstrating the fact that politics (i.e. doing things "for the people" because they want/demand it for their support) often outweighs practical considerations (the fact that what they want will bring about worse conditions in the mid-long term). Unfortunately, I suspect, particularly with the trend of increasing regulatory interventions, that the practical side is not even considered- governments are taking actions to appease "the masses" without any regard to consequences, much less morality or individual rights. I was somewhat disappointed to see morality clearly avoided in this book, though many of the "interventions" were clearly evil. I was also disappointed with a lack of warning to investors to not reward those who would do or have done them harm. When a dictator nationalizes (illegally and immorally loots) private property but then is unable to "make it work" and wants to "re-privatize" it to lure in more foreign capital and know-how, those that supply their capital are encouraging the bad behavior to repeat itself, and not just in that instance, but by all onlookers who see that unjust behavior is rewarded. While the book does give some advice about how to assess and monitor political risks, most is far from simple, and therefore it will likely only be used by risk analysis areas of governments and large firms. That said, the book is well written, and good food for thought, so if one enjoys the subject material, I'd recommend it, even if it's not personally useful. I have many books on investing, and I love studying politics and economics and the various ways that they influence each other. I have never found a book that actually addresses this, and with such clarity and factual, historical basis. Using political (global) historical facts and tying those facts with the variations within the global markets, the authors not only teach about how things happened "back then", but also shed light on what is happening "right now". I believe that this book is a must-read for anyone who takes part in the American process of voting, saving their money, investing, and planning on things we take for granted (like retiring or seeing their investments grow for other ventures). I am going to re-read it again--it seems that the more I read it, the more I find in it that I find both interesting and applicable to my own investment choices. After I do re-read it, I am going to pass it along to my children to read--this knowledge will benefit them as they begin investing and increase their involvement in political purposes. I became interested in this book because of the announced intent to look at a feature of statistics oft-overlooked: the so-called fat tail. One of the most criticised books of recent years was the Bell Curve The Bell Curve: Intelligence and Class Structure in American Life.This work promoted the notion of conformity to a statistical feature which is often assumed to provide a model upon which to base social policies and which purports that much of society conforms to that feature. Although the premise of this book is essentially that for strategic investment purposes the standard distribution model has limited applicability, it actually undermines a lot of the tools provided for strategic investment by the economics community. In that regard it has much in common with some other books which have found popular acclaim in recent years i.e. The Death of Economics,Butterfly Economics: A New General Theory of Social and Economic Behavior,Why Most Things Fail: Evolution, Extinction and Economics. In a fascinating examination of the problems facing strategic investments, the authors include a chapter on the notion of uncertainty. Despite the pretensions of economics to be a science, if one examies the history of the subject one finds that it is littered with failed models and predictions. The recent credit crisis is a situation marked by few predictions of it's impending occurrence. One of the big scientific ideas of the past few decades is the ideas of Chaos and Anti-Chaos, popularised by James Gleick Chaos: Making a New Science. Here the notion of interconnectedness having feedback effects which mangify to affect a whole system is given much prominence. Uncertainty and chaotic effects place economics per se in a difficult predicament. The models it uses are based on past events and predict a future based on those events and are thus unable to cope with novel situations. If this were not enough, the subsequent chapters together deflate much of the economics which supports the decisions which go into current strategic investments and show, successfuly in my view, how econimcs is clearly subordinated by politics in coming to better decisions enabling more successful outcomes. I find much in common with ideas found in another text The Living Companywhich combine to provide an alternative prospective for a broader framework of analysis to support strategic investment decisions. Although the purpose of the book is not to shake the foundations of the economics profession as we know it, it does more than just weaken the superstructure of formal mathermatical modelling which characterises much of what is generally accepted as economics per se. With the economic and financial crisis facing the world today, a reappraisal of the subject is more than justified. Although currently there is a resurgence in the ideas of Maynard keynes, I believe that books such as these will generate interest in alternative prospectuses of economics other than those standards which have been taught in so many universities for so long. Whenever I am at a business conference I seek out people from Eurasia Group, as they are usually the smartest people in the room (besides our team!). As head of a consulting firm which offers strategic advice to various constituencies, I need to not only keep abreast of current affairs but more important I need to be able to read a situation based on limited facts and come out with a relevant conclusion. For years I have sought out material from the Eurasia Group, and specifically from Ian Bremmer. I am a student of history, and I sturdy history to understand how particular events in the present create a certain future. Bremmer and Preston Keat `teach a man how to fish,' in the words of that old proverb. Such insight is needed in uncertain times. Risk is an inherent part of business and anyone who has managed a business at any level knows that risk comes into play on a daily basis. In today's modern, global economy, the risks are greater than before and are often more difficult to predict. The Fat Tail is a book that discusses many of these unique risks, offering some ideas for spotting these risks and taking the proper precautions to make sure the effects are minimized. I have worked for many years in management and I am fully aware of these additional risks. It would be nice if risk was limited to supply/demand issues or employee retention but, unfortunately, risk is much more widespread than in the past and we have the global economy to thank for much of this. Some precautions can be taken, but there are some risks that cannot be controlled as well as others. A civil war, excessive regulation, foreign currency exchange issues, expropriation, and many other unforeseen events can cause a drastic change to the business climate and thus have a dramatic effect on business. The Fat Tail discusses these many different types of risk that we, as managers, face in the new century and I can relate directly to what much of it says. To backup its key points, The Fat Tail offers many examples from history that show how an unexpected event led to complete turmoil in every facet of life. In the past, revolutions and the lack of sufficient warnings were often cited among the many reasons why businesses suffered extraordinary losses. Today, certain countries of the world are known for their political instability and information regarding instability is more easily obtained, thanks to the information age in which we live. However, there are new risks today that are not always easy to predict, such as state failure, terrorism, expropriation, and more. And the fact that nothing has happened yet in a particular country is one of the main reasons why the potential for business disaster is so great. Like The Fat Tail points out, management personnel tends to get too relaxed when nothing bad has happened for a period of time and because of this, they are likely to let their guard down. Thus, when a political problem arises, many businesses will be trapped in a no- win predicament that could cost millions and could possibly even bankrupt the company. The Fat Tail is written in a very academic way. The authors write this book like graduate- level university students composing a long research paper. They forgo creative writing skill in favor of the facts. They want you, the middle or upper manager of a business, to know the potential problems that await you if you do not take foreign risks more seriously. They offer historic examples that show what can happen if you develop the dangerous attitude that says "it can't happen to us". They want companies to be prepared for the worst and they offer some advice on ways to stay alert and protect one's business interests. Risk is all around us and its complexity is greater than ever before. Management personnel in the United States are fully aware of the problems that can result due to terrorism but terrorism is only one of many potential disasters that businesses face each day. Refusing to recognize these threats and failing to take any precautions could lead to serious problems down the road and The Fat Tail wants to make sure that businesses, as well as individual investors, are prepared for the worst. This book examines the political risks to investments outside the normal risk in a standard world seen as a bell curve. As the bell curve exists there are "Bumps" in its flow or "Fat Tails" of unimagined occurrences. Some of these were the Russian bond default that brought down Long Term Capital Management and the 1998 Asian Financial crises. While these are one in a hundred years events it only takes one to destroy a company if risk is not managed properly. Much like the old White Swan theory that believed with no doubt that swans were always white, it only took one black swan in Australia to prove the belief to be 100% wrong even though it was thought of as fact. This book describes how to deal with uncertainty. The role Geopolitics play in investing. The political risk that exists in countries based on their social discontent and leadership. You will see the impact domestic instability, revolution, civil war, and state failure has effected investments in the past. How terrorism could effect businesses in the future based on the past. You will see how to detect the inherent dangers of expropriation in socialist and communist countries. Excellent, Insightful and Relevant: Great Read! This is a superb book and well worth the time to read especially given today's political and financial climate. The author(s)begin by presenting several relevant examples of how politics influence finance but this books goes beyond that basic explanation. For those that liken it to Taleb's "Black Swan", this is different and not at all a re-hash of Taleb's information. For example, while Taleb points out the basic inability of "black swan events" to be predicted, The Fat Tail presumes the exact opposite...these relatively rare events can be predicted due to the compiled effect of several small events taking place one after another. This leads to the second major differentiation - whereas Taleb sees these rare events as single-isolated rare but major events...the Fat Tail presumes many are actually comprised of a series of seemingly small and even superficially unrelated events which when combined, create the stage for the rare but significant outcomes exhibited. The authors do a superb job of providing highly relevant and readable examples throughout...while a few others found the writing to be a bit on the academic side, I personally found it enjoyable and engaging. I'm NOT an economist nor "numbers geek" although I have at least a working knowledge of the fundamentals (MBA, Ph.D studies)...whether this makes a difference or not is difficult to say. On the one hand, this seems quite clear and the book rarely uses any type of complex concepts. On the other hand, perhaps having a bit of background makes this all the more enjoyable. Unlike the vast majority of so called "investing" books, this is an intelligent discussion of the "why" which allows the investor to understand and take action. If you are searching for a "step one - do this and buy my newsletter for more information" then you will be sadly let down. On the other hand, if you enjoy understanding the concepts in order to form your own strategy there is a high likelihood you will enjoy this book.